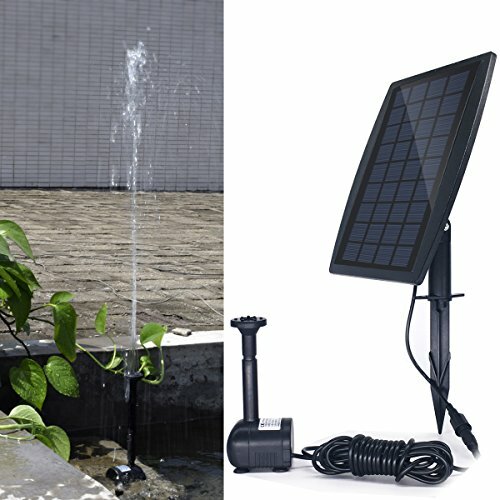 YADICO Solar Powered Fountain 2.5W Solar Panel Kit 200L/H Submersible Water Pump for Bird Bath Pond, Pool, Garden Decoration | Fountain City Art Ctr. 1. The pump is driven directly by the sunlight. So it will work continuously only when the sunlight is enough. As the power of the solar panel is depended on the sunlight, the pump is also affected by weather, seasons, places, etc. 3. Don't put the solar panel and the control box in water, or it will be damaged. 4. Clean the pump regularly. If it's duty, it will stop working. 5. The solar panel is made up of glass and metal. You must be careful when using it. And don't let children play with it. 6. The moment that the pump starts to work, its spray height will be higher than the normal range and it will return to normal after 3-5 seconds. 1. Assemble the product according to the sketch map of the instruction. Then set it on the places where the solar panel is not sheltered from the sun. 2. Turn on the switch, the pump will work normally as soon as the sunshine is enough. 3. There is some air in the pump at the moment when it is put in the water. You'd better not concentrate the spray head to the pump until it sprays normally. Powerfull: Benefited from the 9V/2.5W solar panel, the pump generates a max flow at 200L/H. Sprayer for Different Water Style: 3 kinds of replaceable fountain head for your options. Adjustable angle: The adjustable angel of the panel allows excellent charge of sunshine. Multiple Applications: This eco friendly solar pump is perfect for bird bath, fish tank, small pond, pool, garden, water circulation for oxygen. Your garden would definitely catch all the attention of the passers-by. It makes your yard look so amusingly decorated by the solar water pump. If you have any questions about this product by YADICO, contact us by completing and submitting the form below. If you are looking for a specif part number, please include it with your message.